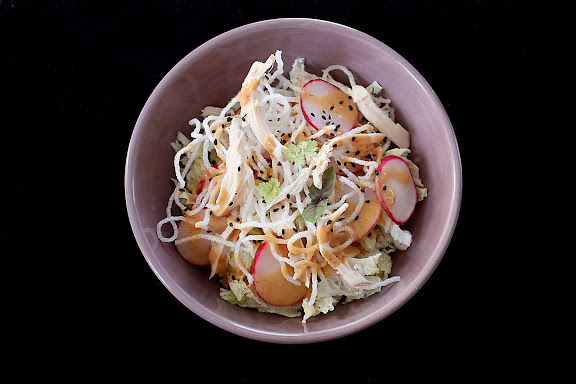 In college, a friend introduced me to a salad made of fresh napa cabbage, sliced thin, dressed in a tangy sesame-ginger dressing, and topped with toasted almond slices and bits of instant ramen noodles, right out of the package. 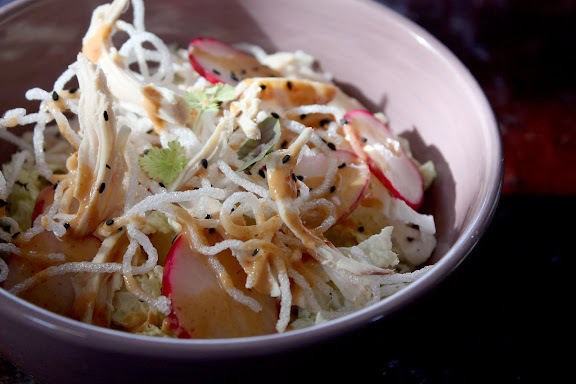 This salad, a beautiful symphony of crunch and tang, was a hit among our group. Should you be interested in the recipe, I’m sure, it can be found online very easily due to the popularity. This no-recipe version of mine is very similar to that famous salad. The crunchy noodles, however, are not from a package. Well, sort of. When I made this salad the other day, I didn’t have any ramen on hand, so I broke up some uncooked glass noodles (also known as cellophane noodles or วุ้นเส้น) and shallow-fried them. 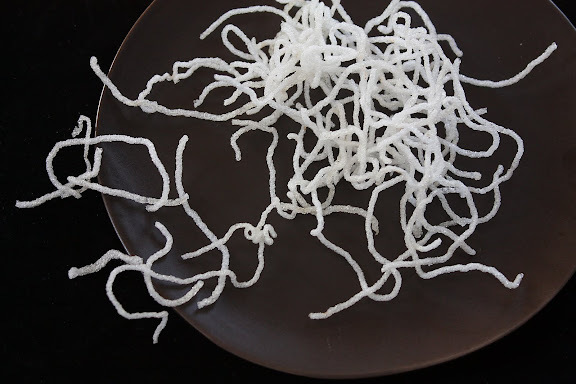 Glass noodles take no more than two seconds — really — to crisp up when the oil is at the right temperature. You drop a few pieces in, see they puff up right before your eyes, and scoop them up from the oil right away to a paper towel-lined plate. Then I sliced up the light green leafy part of a napa cabbage. About two cups per serving sounds about right. I washed the cabbage and spun it bone dry in a salad spinner. Then since I had some fresh radishes in the crisper, I sliced them up and threw them in. Some black sesame seeds also went in for extra flavor and color contrast. To keep this vegetarian, you can stop here. I had some leftover rotisserie chicken, so I shredded up the breast meat and added it to the salad to make a meal out of it. Lastly, the pièce de résistance: my mom’s Thai peanut sauce was slightly thinned out with a bit of cider vinegar and drizzled on top. This peanut sauce is so easy to make and versatile. I use it as a dipping sauce, stir-fry sauce, and salad dressing. If you’re a Thai peanut sauce fan, I encourage you to make a jar and keep it in the freezer. The sauce freezes beautifully. Just spoon it into an ice cube tray and freeze. Once it’s frozen, pop out the peanut sauce cubes and store them in a freezer bag. Whenever you want to use it, just take out as many cubes as you need and thaw them in the microwave. Easy. Such a lovely salad and sounds great the peanut dressing! I made a few things with napa cabbage over the winter break, should be posting one this week to participate. QS – Of course! Would love to see a blog post in Indonesian! oo they puff up so nicely! I have to try that soon. Great idea serving with peanut sauce! That looks wonderfully crunchy, and I love the versatility of your peanut sauce. I could almost feel the crunch, that salad looks so fresh and tasty. The peanut sauce sounds delicious.